Are no-calorie sweeteners safe to eat? Many Americans have fed their sweet tooth with artificially sweetened diet drinks and snack foods. When Susan Schiffman recently brought her 8-year-old granddaughter to a birthday party, the hostess proudly informed Schiffman, a food sweetener researcher and adjunct professor at North Carolina State University, that she’d made the cake with the artificial sweetener Splenda, rather than sugar. Schiffman asked the hostess not to serve it to her granddaughter. Schiffman and several leading nutritionists have questioned the safety of children eating any low-calorie sweeteners as an alternative to sugar — even the newest ones derived from plants such as stevia and monk fruit extract — because it’s not clear how they’re metabolized by the body given how little they’ve been tested in people. As sugar has become public enemy number one in the battle against obesity, many Americans have fed their sweet tooth with artificially sweetened diet drinks and snack foods. The latest statistics from government dietary surveys reveal that more than 12 percent of children now consume artificially sweetened beverages, double the rate of 15 years ago. Twenty-four percent of adults do too, up from 19 percent. In 2007, sixteen of the largest beverage and snack food makers pledged to slash calories to help Americans slim down. Since then, manufacturers have sold 6.4 trillion fewer calories in 2012 compared with five years earlier, according to an analysis released in January by the nonprofit Robert Wood Johnson Foundation. Coca-Cola alone has rolled out more than 100 no- and low-calorie beverages. While the American Heart Association recently concluded that replacing sugary foods and drinks with those containing no-calorie sweeteners is one way “to limit calories and achieve or maintain a healthy weight,” researchers have been unable to establish that such a swap promotes weight loss. 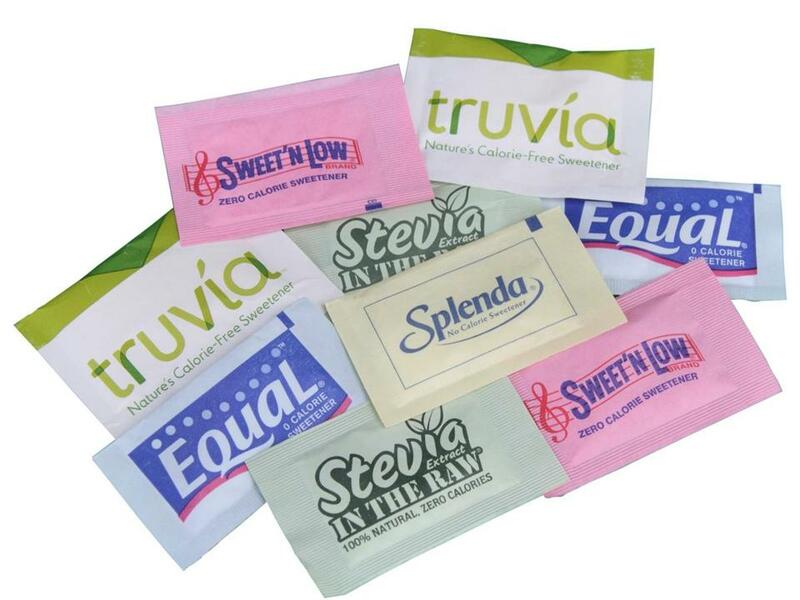 The Center for Science in the Public Interest recently analyzed the latest research on low-calorie sweeteners and came up with a ratings system to guide consumers. A Johns Hopkins School of Public Health study earlier this month examined national dietary surveys from nearly 24,000 Americans and found that overweight folks who drank diet beverages actually consumed 88 more calories per day, on average, compared with those who drank sugary beverages; those at the obese end of the spectrum who drank diet drinks consumed a total of 194 extra calories per day more than their counterparts who drank beverages sweetened with sugar. “Simply switching to diet soda does not appear to be enough to promote long-term weight loss,” said study leader Sara Bleich. Dieters may compensate by eating more sweet snacks, she added, possibly because beverages sweetened with no-calorie substitutes fuel sugar cravings by reinforcing the body’s preference for sweets without providing calories to reduce the appetite. Partly for this reason, leading nutrition experts who spoke with the Globe said they not only limit their sugar intake but also make efforts to completely avoid artificial sweeteners like sucralose, aspartame (NutraSweet), and saccharin, and even the newer “natural” sweeteners made from plants like stevia and monk fruit extracts, which haven’t been well studied. While sugar also comes from a plant, its effects on the body are well known because it has been added to foods for centuries. Dr. Walter Willett, chair of the department of nutrition at Harvard School of Public Health, also avoids artificial sweeteners — which are 200 to 600 times sweeter than sugar — largely because he believes they distort taste preferences. Thus, a crisp Macintosh apple or baby carrot doesn’t taste as sweet. Unknown safety risks have also made some researchers wary. Animal studies suggest an increased risk of tumors associated with large doses of aspartame and a potential for sucralose to wipe out beneficial bacteria in the gut and to interfere with how the body breaks down medications. Aspartame, which has been in the US food supply for more than three decades, is considered by some food scientists to be the least worrisome because it breaks down into amino acids, the building blocks of protein common in many foods. But the Center for Science in the Public Interest, an advocacy group based in Washington, D.C., recommends that people avoid it because three studies conducted in rats and mice found that it increased the risk of lymphoma and leukemia when given to the animals in high doses. “If this is a safe sweetener, we shouldn’t be seeing cancer in rats fed it, even if given at a high dose,” said Michael Jacobson, the center’s executive director. “In one of the studies, the rats were fed moderate doses of aspartame during their entire natural lifespan,” and the Italian researchers still found excess tumors when the rats were later autopsied. Willett’s own research looking at the dietary habits of physicians and nurses, which was published last year in the American Journal of Clinical Nutrition, found a small increased risk of certain cancers in men who drank one aspartame-sweetened soda a day compared with those who drank no diet soda, but these results might have been attributable to chance or some other factor, because women who drank diet soda did not have an increased risk. Aspartame manufacturers, like NutraSweet which sells the sweetener Equal, emphasize that studies conducted by industry toxicologists found no evidence of tumors in animals who consumed the product. Such findings were submitted to the FDA decades ago and formed the basis for the agency to greenlight aspartame to be added to the food supply. Since then, “the overwhelming body of scientific evidence clearly demonstrates that aspartame, even in amounts many times what people typically consume, is safe and not associated with adverse health effects,” reads the NutraSweet website. A handful of recent sucralose studies have also raised warning flags: A 2008 rat study conducted by Schiffman and toxicologists at Duke University — funded by the Sugar Association — indicated that sucralose might interfere with certain medications. The study also found that rats fed moderate to high amounts of sucralose had lower levels of beneficial bacteria in their gut than those who weren’t fed any, which could make them more susceptible to gastrointestinal disorders. Lee Grotz, director of medical affairs for McNeil Nutritionals, which manufactures Splenda, said the study used poor methodology and reached faulty conclusions that have yet to be replicated in subsequent studies. While the company hired researchers to review the Duke study — which the researchers ultimately refuted — McNeil Nutritionals has not published any new data that have come to different conclusions, and Grotz would not comment on whether any studies were underway. Other sucralose research, published last year in the journal Diabetes Care, found that sucralose caused a more rapid spike in blood sugar and a bigger surge in the hormone insulin — mimicking the early stages of diabetes — among 17 obese volunteers who consumed the sweetener before a sugary beverage compared with when they consumed the beverage alone. Water is likely a better option than diet drinks for weight control, but the Johns Hopkins study didn’t answer that question. In the meantime, beverage makers have been eagerly testing newly approved “natural” sweeteners like stevia (also called rebiana) and monk fruit extract in their sweetened drinks in a nod to consumers who are looking for products without artificial ingredients. globe.com. Follow her on Twitter @debkotz2.